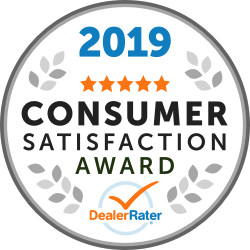 Frank Myers Auto Maxx has been awarded the 2019 DealerRater® Consumer Satisfaction Award. This is the 3rd time they’ve received this prestigious honor. This is a recognition auto dealerships can earn by delivering outstanding customer service as rated by online consumer reviews. DealerRater, the car dealer review site for consumers, created the Consumer Satisfaction Awards to enable online car shoppers to instantly spot car dealerships that provide high-quality customer service. Consumer Satisfaction Awards will be given annually to the top 10 percent of U.S. new-car dealers based on their PowerScore™, as well as all U.S. used-car and Canadian (new and used) car dealerships that meet DealerRater’s Dealer of the Year criteria—receiving at least 25 annual reviews and maintaining an average PowerScore rating of 4.0 out of 5.0. Dealers can increase their PowerScore ratings by getting more reviews, and improving consumer feedback on the dealership’s customer service, quality of work, friendliness, pricing and overall experience. Frank Myers Auto Maxx has achieved consistently high marks on the DealerRater website, placing it among the top dealerships nationwide. Online shoppers visiting the Frank Myers Auto Maxx dealer review page on DealerRater.com will find a Consumer Satisfaction Award winner designation. “We’re humbled to receive this honor for the 3rd time,” said Tracy Myers, owner of Frank Myers Auto Maxx. “Our Team is grateful, blessed and honored to serve our community and the people who live in it.”. DealerRater was founded in 2002 as the first car dealer review website worldwide. DealerRater is the world’s No. 1 online resource for anyone seeking trusted, third-party information on automobile dealerships. DealerRater features nearly 41,000 U.S. and Canadian car dealers, more than 1.7 million consumer reviews and a million-plus cars listed for sale. DealerRater attracts more than 12 million consumers every year to the site to search for car dealerships, read reviews, write their own descriptive reviews and find car deals – all for free. DealerRater offers qualified car dealers a Certified Dealer Program as a reputation-building management tool to help them grow their online presence and achieve higher SEO rankings across the Web. Its national network of more than 5,400 dealers are members of the award-winning DealerRater Certified Dealer Program. DealerRater is proud to have earned the No. 137 position on the 2012 Inc. 500 list, an exclusive ranking of the fastest-growing private companies in the United States. DealerRater is well poised to continue its global expansion, accelerate product innovation and evaluate strategic acquisition opportunities with a recent equity investment from Great Hill Partners, a Boston-based private equity firm focused on growth companies. DealerRater was also recently awarded a Technology Leadership Award from Dealer Marketing Magazine and another “Top Rated” Reputation Management award in the sixth annual DrivingSales Dealer Satisfaction Awards. For more information, visit www.DealerRater.com or call 800-266-9455. The original Frank Myers Store was started 90 years ago by Frank Myers, the Great-Grandfather of the current owner Tracy Myers and the Grandfather of the previous owner, Franklin Myers. Tracy has spent the past 20+ years trying to change the landscape of the car business and the bruised reputation of car salespeople all over the country. Tracy was also one of the first 100 Certified Master Dealers in the Nation, a NIADA Eagle Award Winner and was the youngest recipient ever to be honored with the highest available distinction in the used car industry…the National Quality Dealer award. Frank Myers Auto Maxx has been named one of the fastest growing privately owned small businesses in the country 5-times by INC magazine, was named to the INC Small Business Hall of Fame, was named The Best Place To Buy A Car in the Triad 2-times by the readers of YES! Weekly, was named Best Used Car Dealership finalist by the readers of the WSJ and was recognized as the #1 Small Business in NC by Business Leader Magazine. Winston Salem Independent Dealer Frank Myers Auto Maxx has been named as one of the top 50 independent auto retailers across the nation by Auto Dealer Monthly. Of the 50 awarded, only 2 dealerships were chosen from North Carolina. This year is the fifth consecutive year that Auto Dealer Monthly has recognized dealerships across the country for their sales and service performance. The top 50 were announced in the July issue of the automotive publication. Although many of the dealership owners operate more than one location, Tracy Myers, Owner of Frank Myers Auto Maxx, is a single-location dealer. The used car dealership, auto service facility, auto reconditioning center and auto rental business are located on nearly 5 acres off of Highway 52 in Winston Salem, NC. Tracy Myers literally grew up in the automotive industry, having worked at Frank Myers Auto for almost 18 years and bought it from his father 6 years ago. He has implemented ground-breaking processes and guest-friendly procedures that reflect his desire to change the perception of the used car industry in which he loves. Myers has become known as an innovator for his use and integration of internet technology in the world of car shopping. From their famous “Everybody Rides” program to their new 30-Day Satisfaction Promise to social media and internet relationship building, Frank Myers Auto Maxx has dedicated their careers to finding new ways to help people find, qualify for and own the vehicle of their dreams with little or no money down…even with less than perfect credit. 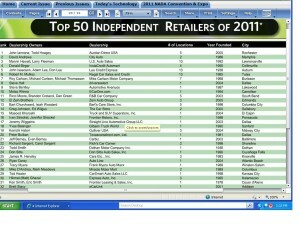 For a full list of Auto Dealer Monthly’s 2010 Top 50 Independent Retailers, including Frank Myers Auto Maxx, you can visit http://www.autodealermonthly.com/. The owner of Frank Myers Auto Maxx, a Winston-Salem used car dealership, is scheduled to appear on ABC, CBS, NBC, ABC and FOX affiliates across the country on The Brian Tracy Show. The owner of a Winston Salem used car dealership, Tracy Myers, will be appearing on The Brian Tracy Show in the first quarter of 2011 to discuss the secrets of the success of his dealership during a recession. The interview with Mr. Myers will appear on The Brian Tracy Show when it premieres during the first quarter of 2011. The Brian Tracy Show will appear on NBC, CBS, ABC and FOX affiliates throughout the country. Brian Tracy is Chairman and CEO of Brian Tracy International, a company specializing in the training and development of individuals and organizations. Brian’s goal is to help you achieve your personal and business goals faster and easier than you ever imagined. Brian Tracy has consulted for more than 1,000 companies and addressed more than 4,000,000 people in 4,000 talks and seminars throughout the US, Canada and 40 other countries worldwide. As a Keynote speaker and seminar leader, he addresses more than 250,000 people each year. He has studied, researched, written and spoken for 30 years in the fields of economics, history, business, philosophy and psychology. He is the top selling author of over 45 books that have been translated into dozens of languages. He has written and produced more than 300 audio and video learning programs, including the worldwide, best-selling Psychology of Achievement, which has been translated into more than 20 languages. He speaks to corporate and public audiences on the subjects of Personal and Professional Development, including the executives and staff of many of America’s largest corporations. His exciting talks and seminars on Leadership, Selling, Self-Esteem, Goals, Strategy, Creativity and Success Psychology bring about immediate changes and long-term results. Prior to founding his company, Brian Tracy International, Brian was the Chief Operating Officer of a $265 million dollar development company. He has had successful careers in sales and marketing, investments, real estate development and syndication, importation, distribution and management consulting. He has conducted high level consulting assignments with several billion-dollar plus corporations in strategic planning and organizational development. He has traveled and worked in over 80 countries on six continents, and speaks four languages. Brian is happily married and has four children. He is active in community and national affairs, and is the President of three companies headquartered in Solana Beach, California. The original Frank Myers Store was started more than 83 years ago by Frank Myers, the Great-Grandfather of the current owner Tracy Myers and the Grandfather of the previous owner, Franklin Myers. Tracy has spent the past 15+ years trying to change the landscape of the car business and the bruised reputation of car salespeople all over the country. Tracy was one of the first 100 Certified Master Dealers in the Nation, a NIADA Eagle Award Winner and was the youngest recipient ever to be honored with the highest available distinction in the used car industry…the National Quality Dealer award. Frank Myers Auto Maxx was recently recognized as the #1 Small Business in NC by Business Leader Magazine, one of the Top 28 Independent Automotive Retailers in the United States by Auto Dealer Monthly Magazine, one of the Top 10 Internet Auto Retailers in the Nation & one of the Top 3 dealerships to work for in the country by The Dealer Business Journal. Tracy is also the Co-Creator of the “Everybody Rides” program and author of the best selling book “Car Buying Secrets Exposed: The Dirty Little Secrets of a Used Car Dealer”, available at Amazon.com and better bookstores. He is a Christian Business Owner whose goal is to run his business “By the Book”. The dealership specializes in helping people find, qualify for and own the vehicle of their dreams with little or no money down…even with less than perfect credit. Tracy Myers, the owner of Winston Salem used car dealership Frank Myers Auto Maxx, was named one of the Triad¹s 40 Leaders Under Forty award recipients for 2011. The award honors the Triad area’s emerging leaders who are shaping its future. The Business Journal and UNCG Bryan School of Business and Economics, the sponsor of this year¹s awards, thanks all of the winners for their dedication to making a positive difference in the lives of others by driving success for their employers and empowering their respective communities by giving of their time and talents. WINSTON SALEM, NC –Frank Myers Auto Maxx, a used car dealership in North Carolina, has announced its title sponsorship of the Sixth Annual Fundraiser benefitting Outreach Alliance For Babies. The announcement was made this morning during a press conference held at Uncle Franks Training Center in front of a standing room only crowd. The Outreach Alliance for Babies’ fundraiser is an evening of jazz, food, a baby fashion show and a silent auction. The 2010 event will be held Saturday, Nov. 13 at the Sundance Plaza Hotel in Winston-Salem, NC from 6:30 to 9:30. Corporate and individual tables are available for purchase as well as individual tickets in advance. Founded in May 2005, the Alliance has provided baskets of baby necessities to more than 600 needy local families. Suggestions of families come from various organizations, including the Department of Public Health, Exchange/SCAN and Forsyth Medical Center. Each infant receives a layette, which is hand-assembled by executive director and founder Phyllis Sample Bonds. The baskets hold onesies, diapers, a sleeper, washcloths, a sleep and play set, a diaper bag, bibs, books, burp/lap cloths, snuggies and formula. It costs about $130 to fill one basket. The baskets are possible because of donations and the annual fundraiser. The original Frank Myers Store was started more than 90 years ago by Frank Myers. He was the Grandfather of the previous owner Franklin Myers and the Great-Grandfather of the current owner Tracy Myers. Tracy is a Certified Master Dealer and is commonly referred to as the Nation’s Premier Automotive Solutions Provider. He was also the youngest ever recipient of the National Quality Dealer of the Year award by the NIADA, which is the highest obtainable honor in the used car industry. Frank Myers Auto Maxx was recognized as the number one Small Business in NC by Business Leader Magazine, one of the Top 3 dealerships to work for in the country by The Dealer Business Journal, one of the Top 15 Independent Automotive Retailers in the United States by Auto Dealer Monthly Magazine, one of the fastest growing privately owned small businesses in America by Inc. magazine for the past 6 years and was voted the best used car dealership in the Triad by the readers of YES! Weekly magazine. The dealership specializes in helping people find, qualify for and own the vehicle of their dreams with little or no money down…even with less than perfect credit. For more information on Frank Myers Auto Maxx, please visit their website at: Visit Frank Myers Auto Maxx! Bad Credit & Need A Car? Our "Everybody Rides" program is here to help YOU! © — Copyright 2010 Frank Myers Auto Maxx, All rights reserved.